Florida. 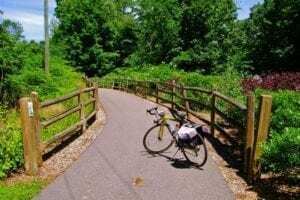 If you have a few days–or live in Connecticut, you won’t want to miss the Connecticut B&B Bike Trail, which offers eight different bicycling routes that are supported by bed & breakfasts along the way. The Bucolic Bethlehem trail–starting in Bethelehem CT, is a 30-mile, figure-8-shaped trail through orchards, farms, fields, forests, nature conservancies and lake views. Some other favorites are the Air Line State Park trails and the 10-mile Larkin State Park Trail that connects Middlebury and Southbury, passing horse farms, ponds, wetlands and beautiful streams. While paved trails provide almost unlimited road bicycling opportunities, Connecticut is also home to many mountain biking options as well. If speed is your thing, Powder Ridge Mountain Park in Middlefield, Connecticut offers chairlifts for gravity-fed trails. If you know of (or have ridden and created) a more accurate one-way route on RideWithGPS for any of these Connecticut bike trails, please let us know so that we can improve this page. Of the trails included in the list above, the following are currently part of the East Coast Greenway. The mileage counts reflect the portion of each trail that is on the Greenway. 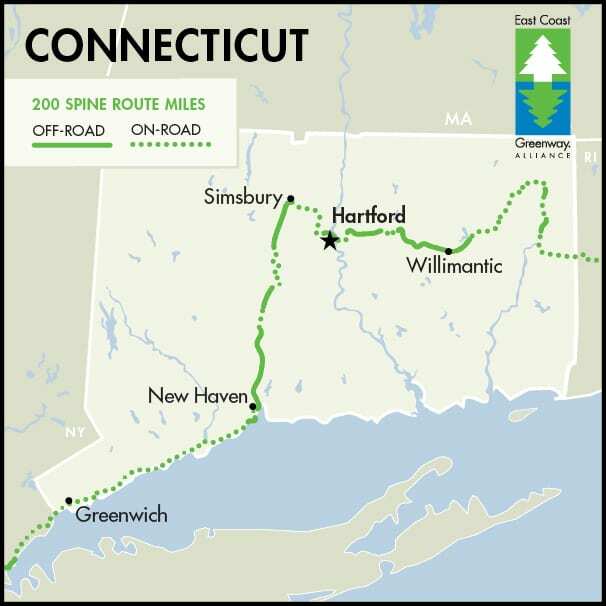 There are a total of 200 trail miles that make up the Connecticut-based East Coast Greenway. For the most part, these trails include a diverse collection of different terrains and backdrops: coastal, inland, farms, urban and parks. The eastern side of Connecticut is the most rural area between Boston and Washington, D.C. Several rail trails, including the Air Line Trail and the Hop River Trail, run through this area, connecting quaint towns such as Willimantic and passing through forests and farmlands. In the middle of Connecticut, 47 miles of East Coast Greenway are nearing completion and are a favorite of many Greenway users. Southwest of New Haven, the interim on-road trail abuts the coast through the suburbs to the Sound Shore communities at the New York state border. And, don’t forget the connection between New Haven and Greenwich with its many scenic views.